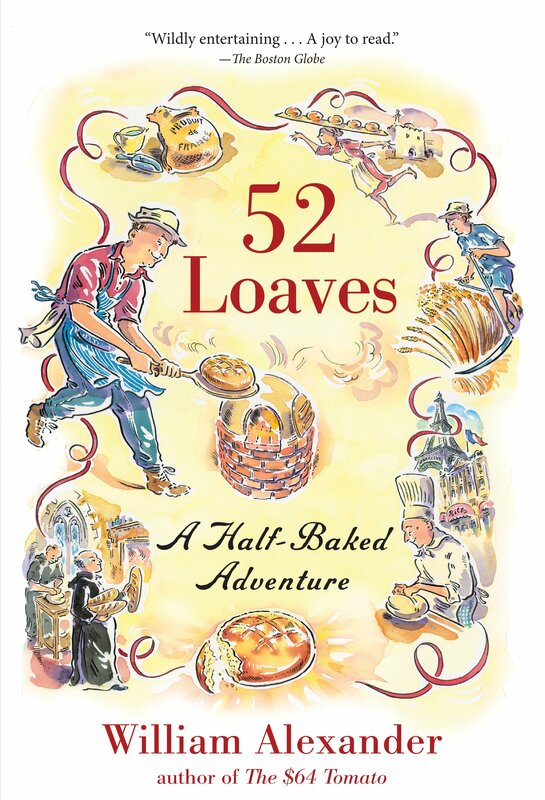 52 Loaves is one of those memoirs where a guy sets out to do something a little ridiculous, bumbles along, has silly adventures, and learns something meaningful along the way. See, for example, Barbara Kingsolver’s Animal, Vegetable, Miracle, and The Know it All and The Year of Living Biblically, both by A.J. Jacobs. 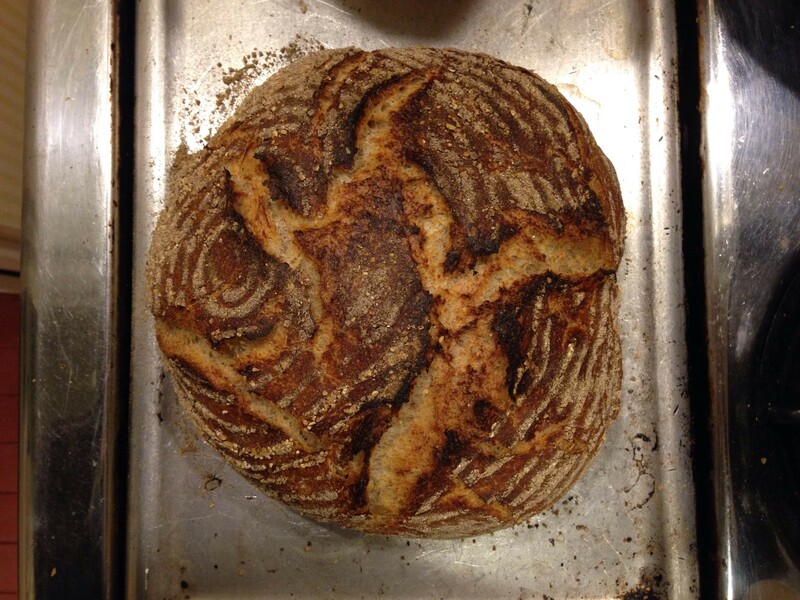 In this instance, Alexander bakes a loaf of bread every week for a year until he manages to make the perfect loaf. 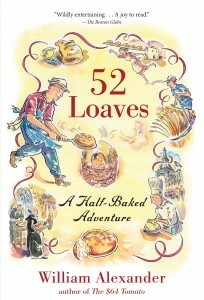 As befits this type of book, Alexander opens with many weeks of dense, tasteless, uninspiring loaves that test his patience, make his children long for croissants, brioche, and real bread, and cause his long-suffering wife to roll her eyes every weekend at her her inept husband’s kitchen flailings. With time, of course, Alexander learns the science of bread making, the art of bread making, and the six-thousand year history of bread eating and presents it all in a way that is warm and light, much like the bread he ultimately learns to bake from sourdough (did you hear that, fans, SOURDOUGH) in an ancient Abbey oven in the remote French countryside. You know how on Friday night you look forward to sleeping in until the hour hand on the clock contains double digits but get up at the usual time anyway out of habit? Sure enough I was awake by 6 AM, but at least had a productive morning Before 11 AM I had completed the following. 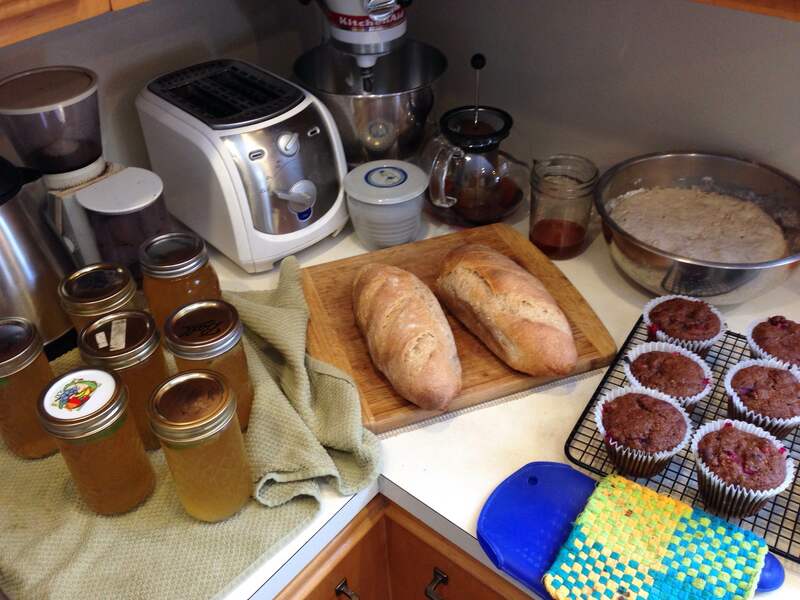 From left to right: Seven half pints of green-tea kombucha re-fermenting with grated ginger and wedges of lime; two batards of rye; a fermenting starter (wait for it) in the metal bowl; and a dozen chocolate cranberry muffins. 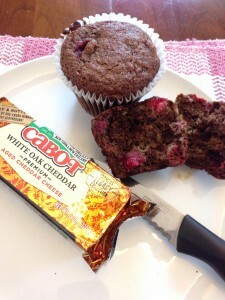 The muffins, in addition to the cocoa and cranberries, were filled with walnuts and were made with my usual blend of found dry ingredients (soy flour, buckwheat, whole flaxseed meal) and wet (mashed banana, okara, also known as the soybean mash leftover from my soymilk maker, honey, and two eggs from my friend the chicken farmer). Perfect weekend breakfast. 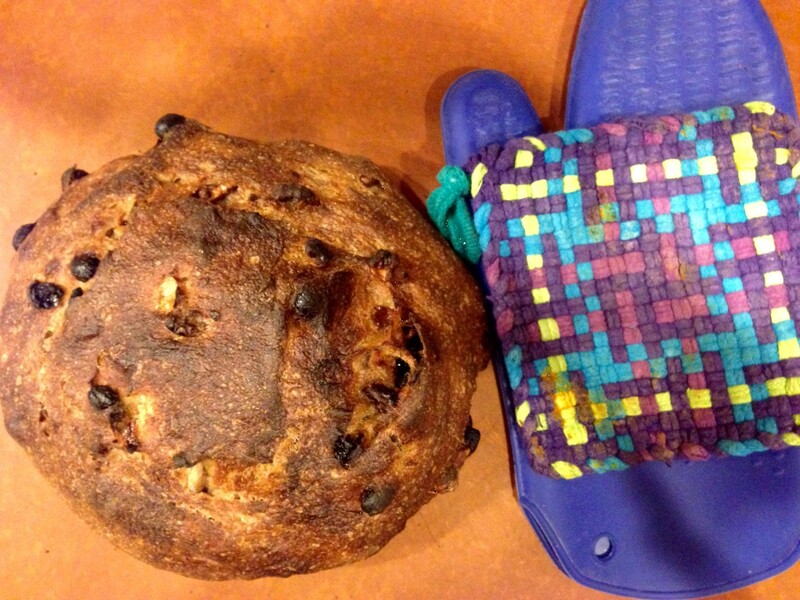 Not a great photo, perhaps, but this miche tasted as good as it looked. 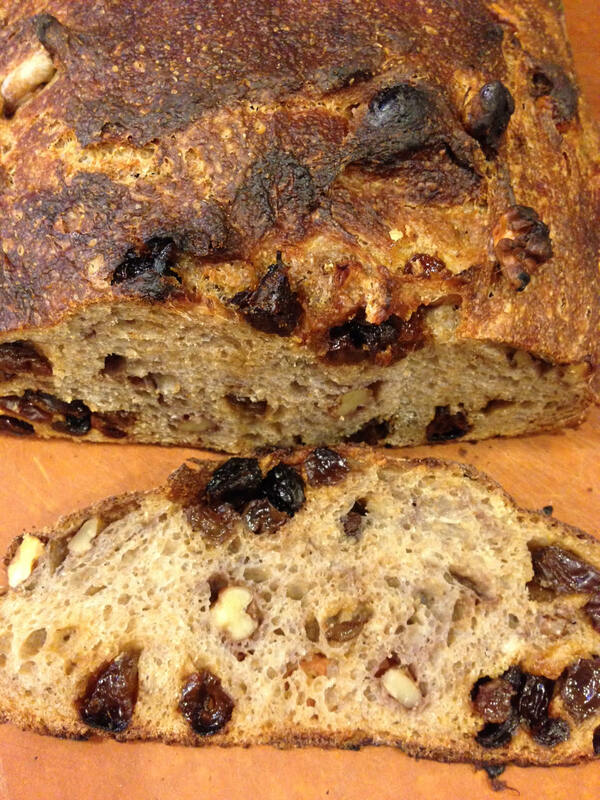 The crust was crackly and the interior was warm, sour, almost solid in its richness, but still full of irregular crumb big holes and that we bakers are always aiming for. 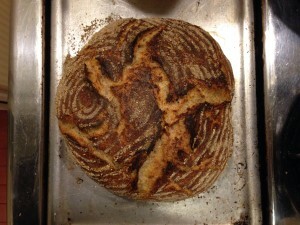 I brought this bread to a dinner party we attended. A perfect complement on an icy winter night to the stuffed cabbage, pickled beets, edamame hummus, green salad, and red wine. For dessert, Sue made Melissa Clark’s lemon bars with olive oil and sea salt that was so good it stunned the group into silence. 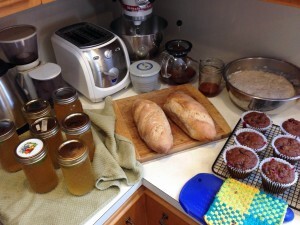 I continue to struggle to find recipes that use my whole wheat starter to its full advantage. My whole wheat starter just doesn’t have as much rising power as either of my white starters no matter how much white flour I add to the recipe. This dough was very wet to begin with, but cooked up beautifully. The crust was crisp but still thin. The interior was moist and chewy and unlike most of my raisin walnut breads, the inclusions were evenly distributed. The proportions were generous, but not overwhelming. Just waiting to be toasted and buttered. In the central third of this novel, a New Zealand prisoner of World War II, enslaved by the Japanese endures countless, excruciatingly detailed horrors in the jungles of Burma. Only he really doesn’t. 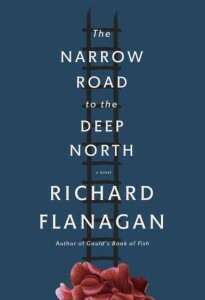 Flanagan does a terrific job of describing kiwis, aussies, and other British subjects who are being driven by their Japanese captors to build a railway through the rainforest. Soldiers starve while working ungodly hours to construct an aimless path through the forest using not much more than their bare hands, fear of being beaten (again), and their slowly diminishing will to survive. They contract ulcers, beri-beri, pellagra, cholera, gangrene, and when they are lucky enough, death. The protagonist, Dorrigo Evans, is the doctor who treats them all and lives throughout the book an extended male fantasy. In the jungle, Evans never really has to do hard labor. He is elected de facto leader of the camp, yet contracts nothing more than a scratch on his shin, the hardship of having to forego a steak as a sign of leadership, and receipt of a letter from his fiance that his mistress is dead. And that brings us to the first third of the book, wherein Evans, bored with his straight-laced fiance takes up with the voluptuous and sexually adventurous wife of his uncle. And in the last third, after the war, when his fiance takes him back, Evans continues to dally with innumerable additional romances. There you have it. In convoluted writing and obscure passages we track a man who is a war hero and unrepentant philanderer. What more could any male reader ask for? 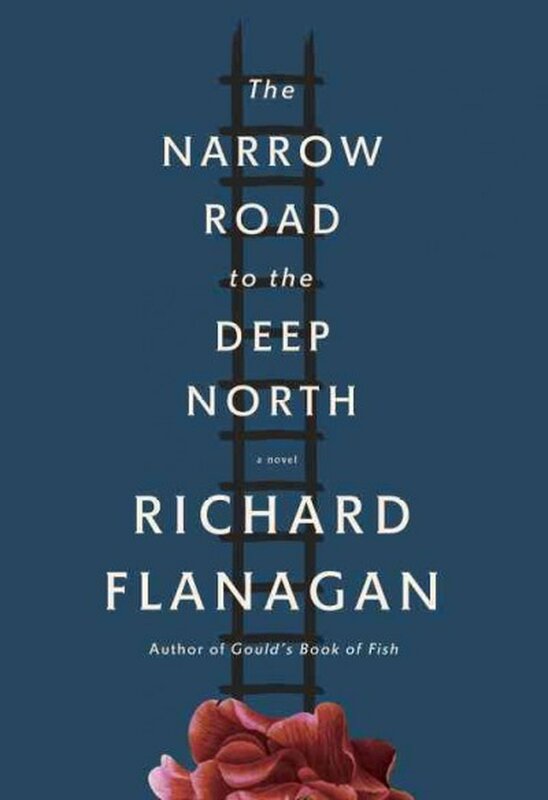 This book won the 2014 Mann Booker Prize and made a lot of 2014 must-read lists, so I might be the only one that didn’t care for it, but seriously? Israel is threatened, and always has been, from within and without. Beyond its borders are hundreds of millions of Arabs, and 1.5 billion Muslims, most of whom would be happier if Israel did not exist, and some of whom are working hard to acquire the nuclear capability to make that wish a potential reality. Within the country’s borders (I know, I know, even their borders are fuzzy), reside an internal, and justifiably unhappy Israeli Arab population, a rapidly growing ultra orthodox group of Jews that control too many state decisions, fanatical settlers, a million Russian immigrants of questionable loyalty to Israel’s original visions of itself, high-tech millionaires indifferent to the plight of the growing underclasses, and a collective malaise brought about by a hundred years of nearly continuous warfare. 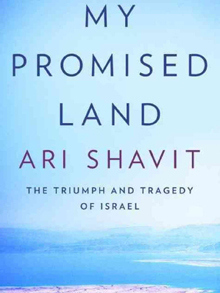 Shavit displays each worry beneath a bright light and uncovers additional concerns that few native Israelis have paused to consider. Most notable is that the very premise of Israel from Day One of the earliest Zionist Congresses is that Israel was a land of occupation and settlers. Overtaking the West Bank and Gaza was only a continuation of a Jewish plan to escape the ashes of pogroms, centuries of ghettoization, and the Shoa by taking over another people’s land. A lot like Western occupation of the Americas. Like many Israelis themselves, Shavit is loud, arrogant, compassionate, argumentative, insightful, and brilliant. 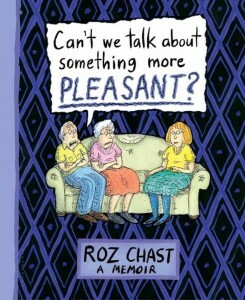 It’s a cartoon memoir of the passing of Roz Chast’s, a New Yorker cartoonist, parents. Her parents lived into their 90s and died the long, slow decline of Americans that can afford resuscitation, hospitalization, round-the-clock care, and reasonable nursing homes. Only the book isn’t entirely about dying. Rather, Chast captures with painful honesty the relationship any adult has with an aging parent, which I have to say, includes almost everyone who is not yet an orphan. So a cartoon book is an excellent way to describe the relationship between children and their parents which so readily alternates between being laugh aloud funny, guilt-inducing despair, unbridled, and occasionally insufficiently requited love, and bone-breaking frustration.